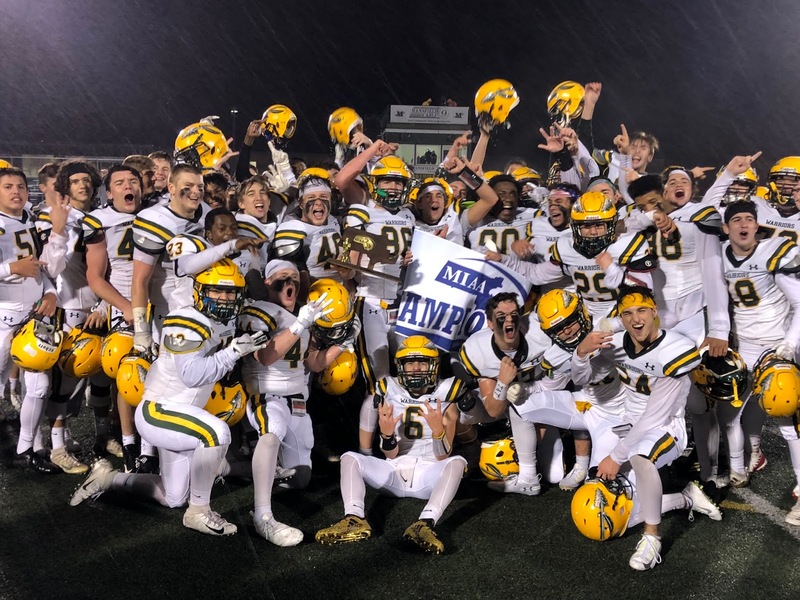 Despite graduating 11 seniors on offense, and returning just six starters on defense from its 2017 Super Bowl team, King Philip has still managed to come within one win of a third straight title. Two years ago, King Philip had its one moment in the sun. At least, that is what everyone thought. Behind John DeLuca, Brett Mazur, and Brendan Lydon the Warriors stormed through the south sectionals. They knocked off perennial powers like Marshfield and Bridgewater-Raynham to advance to Gillette before defeating Reading to win their first Super Bowl in school history. That was supposed to be the end of King Philip's time at the top. A picture-perfect, undefeated season that saw the Warriors leave their dreary history in the past only for them to return to the middle of the pack a year later. Largely due to the prowess of Shane Frommer and fellow captains Andrew Dittrich and Jack Piller, however, the Warriors defended their title in 2017. King Philip flew through the regular season claiming a second straight Hockomock Kelly-Rex league title. Come the postseason they were as good as ever defeating Mansfield and a Bridgewater-Raynahm team hungry for revenge. Come the Super Bowl, many thought Lincoln-Sudbury was too steep a task. Early on, when they fell down 7-0 early and saw their unbeaten quarterback in Lydon go down with a broken leg, the end of the run looked to be staring them in the face. In storybook fashion, however, the Warriors fought back. First came a big throw from then-sophomore Robert Jarest coupled with a Frommer touchdown run. Then, as the fourth quarter entered its latter stages, a strip sack by Jack Webster and finally a game-winning field goal by Cole Baker. King Philip was a Super Bowl champion yet again. They had gone back-to-back with mainstays like Frommer, Dittrich, Piller, and Lydon who not only guided the Warriors to their first two titles in program history, but 25 consecutive victories. But come the spring they all graduated, and with it too so did King Philip's run of dominance across the Massachusetts high school football landscape. That's what the conventional wisdom said. Except come next Friday night when this year's super bowls commence at Gillette Stadium, King Philip will walk out of the tunnel and onto the field for a third consecutive season. They will do so without one standout all-star, or a player of the year candidate and holding an offense that has 11 new starters from a season ago. This time, it'll be coming off a rigorous run through the south bracket that did not come with the benefit of home-field advantage. It's the surest sign yet of a program that has built a culture that generates consistent success. "I really don't know how we're here again," King Philip coach Brian Lee said. "The kids have always bought in, but it was about finding seniors that could give some direction to the underclassmen. Once we found that, it all sort of started to come togehter." Earlier this season it looked as though it would be someone else's turn to emerge from the Div. 2 South field. King Philip's 25-game winning streak was snapped by North Attleboro on opening night as the young Warriors turned the ball over three times including on their first play from scrimmage. They were in search of senior leadership with Jarest and fellow running back Ryan Halliday only juniors. Seniors, who were integral members of the 2017 team but were allowed to remain in the shadows, were forced to take on larger roles both vocally and on the field. "It was just a bit of a struggle to find out who we were," Warriors' captain Jack Webster said. "We knew we had it in us, but it was just about putting it all together." In the Warriors week four matchup against Mansfield it looked like they may never piece it together in 2018. 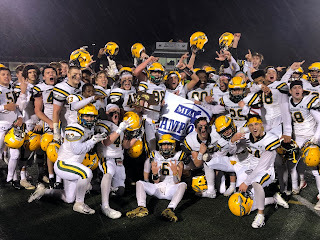 After being up 14-7 to begin the second half, King Philip saw the Hornets turn the tables in the blink of an eye scoring three touchdowns over the course of just two minutes to take a commanding 28-14 advantage. On the verge of being blown out on the road, something unprecedented just 10 months prior, the Warriors discovered some of their championship pedigree. Their defense forced three consecutive punts in a five minute span. Jarest, who had thrown a game-turning interception earlier in the game, regrouped to hit Timmy Nault twice for a pair of touchdowns to pull King Philip within a point with just 34 seconds left. King Philip missed the two-point conversion, and came up short 28-27, but in those four minutes the seeds were planted for another run. "How they handled themselves in the late stages of that first Mansfield, from the rookies on up, it was impressive for them to respond in the way that they did," said Lee. Since that point, King Philip has looked like its old self from the past two years. The Warriors steamrolled a senior-heavy Franklin team in week five before finishing the regular season 5-2. David Morganelli emerged as one of the top receivers in Division 2 and assumed the title of captain. Halliday developed into one of the top two-players in Eastern Mass. due to his physicality both at tailback and at outside linebacker. Nault has stepped up in the passing game, while Patrick Walsh, Sean Piller, Nolan Gunning, and Terrell Jacobs-Baston have helped formed a punishing offensive line. Webster moved to middle linebacker midway through the season and has been the fulcrum of the Warriors defense since then. Surrounding Webster is a secondary that has only improved as the season has gone on. Aidan Bender and Deric Casado have forced a bevy of impactful turnovers, while Tyler Bartlett had a crucial interception in King Philip's opening round postseason win over Braintree. "We all just realized what's gotten us to this point as a team," Bender said. "We all went out there and just started having fun. Losing that first game of the year - obviously you never want to lose - but it kind of took the pressure of in terms of the streak. Then it that Mansfield game it all came together." Its in its postseason run to Gillette, however, where King Philip has truly impressed. Despite facing a pair of daunting road tasks in high-powered Natick and aforementioned Mansfield, the Warriors game plan proved as flawless as ever. In both games King Philip stuck to its guns, relying on a sustained ground attack behind Halliday, an aggressively disciplined defensive approach, and a handful of key plays from Jarest to get across the finish line. They allowed just 14 points combined against Natick and Mansfield while limiting their chances with long, methodical drives. Lee and his coaching staff have leaned heavily on Halliday with the junior back amassing seven separate 30 carry games this season. In its last two playoff games, Halliday combined for 65 rushing attempts. "Coming into the year we told Ryan that he was going to be our guy, and we were going to go as far as he took us mostly on offense," Lee said. "Some kids will turn away from that, but Ryan embraced it. He wants to learn and get better. He just wants the ball." Consistently the Warriors defense seems to lurk in the weeds, standing their ground before coming through with a key tackle for a loss or turnover that changes the whole complexion of the game. In its win versus Natick, it came on the opening drive of the when the unit held the Redhawks scoreless after they moved inside the five. One week later versus the Hornets, with its season potentially hanging in the balance late in the first half and Mansfield on the 20-yard line, it was a forced fumble by Halliday that was recovered by Bender that turned the tide. "After the first Mansfield loss, Coach Lee taught us how to be a better team," Halliday said. "He showed us that even though we don't have one guy, we still have the ability to come together." More so than in past years, King Philip has assumed the mantle of underdog and basked in all its glory. It was evident in the final moments of its sectional final victory. Still trailing 7-3 as the game turned to the fourth quarter, the Warriors embarked on one of their signature drives that has become a calling card for them over the last three years. Halliday carried the ball five times for 36 yards, Jarest came through with a pair of key rushes and then hit Morganelli at the goal line before powering it up the middle on a quarterback keeper. King Philip was in front, but the Hornets still had over five minutes to work with - a chance to once again stun their rivals for a second time in the final moments. The remaining time, however, turned simply into an opportunity for King Philip to close the game with an exclamation point. With the Hornets across midfield, Casado came through with an interception, Jarest picked up 12 yards on third and long, the clock ran out, and the celebration ensued. "It was incredible. It's why you play," Webster said. "(To win on the road), and to celebrate with your own fans on someone else field - there's just no better feeling. We know those Mansfield kids pretty well, and that's something none of us will ever forget." Even with the buses warm, the rain pouring down, and the game long over, some of the Warriors played stuck around for a few extra moments to savor the victory. After reading numerous clips that the championship window had closed and that it was a rebuilding year, they had managed to emerge from the crowded Division 2 South field for a third straight season. No superstar or players that carried the team on their own. Just a program that now expected to win even when no one else did. "It's really incredible when you think about it," Lee said. "We have been going on the road all year long, having played only three games at home, so we knew what to expect. It just really shows what the kids have been willing to put in as a team." In the Division 2 North Final, North Andover put on a full display of why they are considered one of the best teams in all of Massachusetts as they handily defeated defending sectional champion Lincoln-Sudbury by an eye-popping score of 42-0. They have been in a one possession game on a lone occasion this year, and that was a 14-7 win over Division 1 North finalist Central Catholic. "North Andover is just a terrific team. They wow you on film with their speed. They just have playmakers all over the field," said Lee. "They're probably going to be one of the better if not the best team we've played doing our three year run. We'll have to play well and we'll do our best to be ready to go." North Andover will be favored on Friday night to capture its first Super Bowl under the new format, and rightfully so. The Scarlet Knights have the makeup of a championship caliber team, only seeming to improve as the season has gone on. Once again, the numbers point to the smart pick being against King Philip. The Warriors would not have it any other way.